Tom Hart Dyke first shot to international prominence in the year 2000, when he was kidnapped in the Colombian jungle on a plant hunting expedition that went dangerously wrong. After Tom’s return home to his ancestral home of Lullingstone Castle, near Sevenoaks, in Kent, Tom and Paul (Winder) penned the best selling book The Cloud Garden (Transworld 2002) detailing their experiences in the jungle. Tom’s jungle antics – building gardens in the mountains, much to the annoyance of his captors – cemented his reputation as a ‘plant nut’. Later Tom wrote another book – ‘An Englishman’s Home’ – detailing the trials and tribulations of developing the World Garden at Lullingstone Castle. Every stage of Tom’s jungle project has been filmed for the 12 part BBC2 series saving Lullingstone & Return to Lullingstone. The garden opened to the public in March 2005 and has seen a steady stream of visitors entering through the 18th century moon gate, and traversing the pathways (or seas) as they literally walk around the ‘ world in under 80 minutes’. 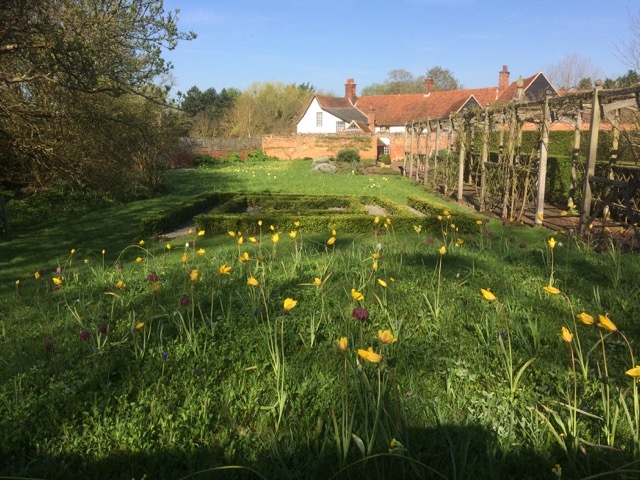 Part of our Heritage Lottery funded project is to collect personal memories of Cressing Temple gardens. See how we are getting on. 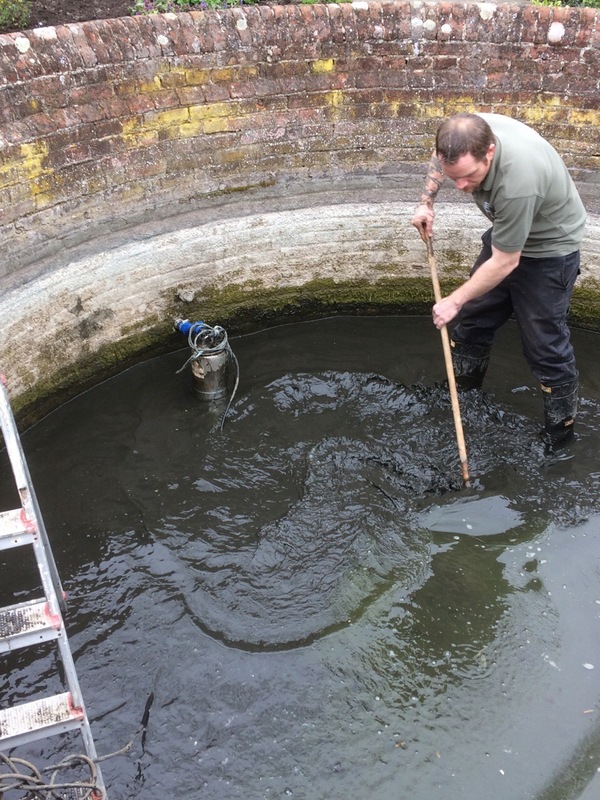 The weeks either side of the AGM have been dominated with our efforts to solve the problem of our murky pond problems. 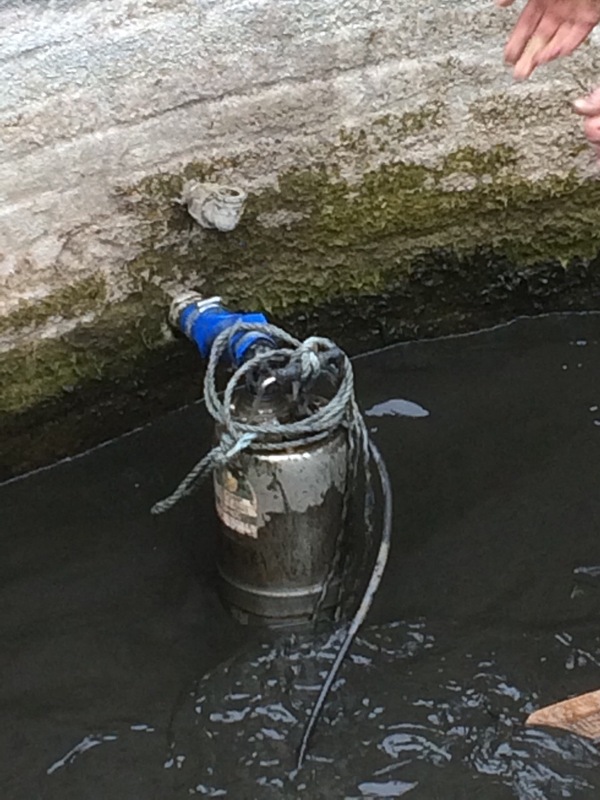 The leak has been getting steadily worse over the past few years and frequent filling up with tap water had done nothing for the water quality – not so much gazing at our reflection in a clear blue surface. more like staring into a bowl of pea soup! Something had to be done and we needed to empty the pond but how to catch fish when you can’t see them? We had no idea how many there were and nothing bigger than a child’s fishing net! Never fear, the ever inventive Pete, the ever ready Paula and the ever willing set of Tuesday volunteers worked out a method and several hours later we had buckets full (about 60 to be precise) of healthy looking wonderfully golden goldfish. Having prepared for this eventuality by putting ‘re-homing goldfish’ notices in the Visitor Centre, we managed to find new (and frankly much nicer) ponds for them all to go to. And we found ourselves a little richer too! 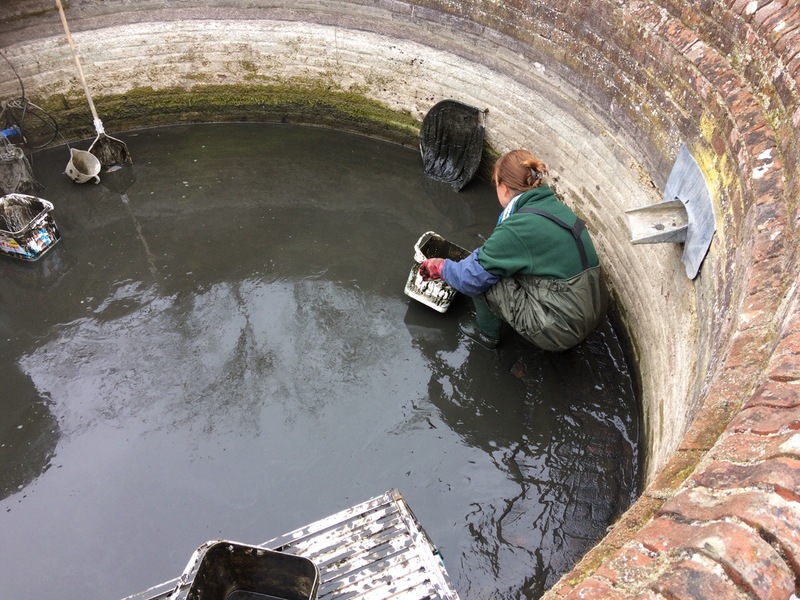 With the fish taken care of we could move to the next stage: draining and dredging. Oh boy, did it need dredging! Yuk. 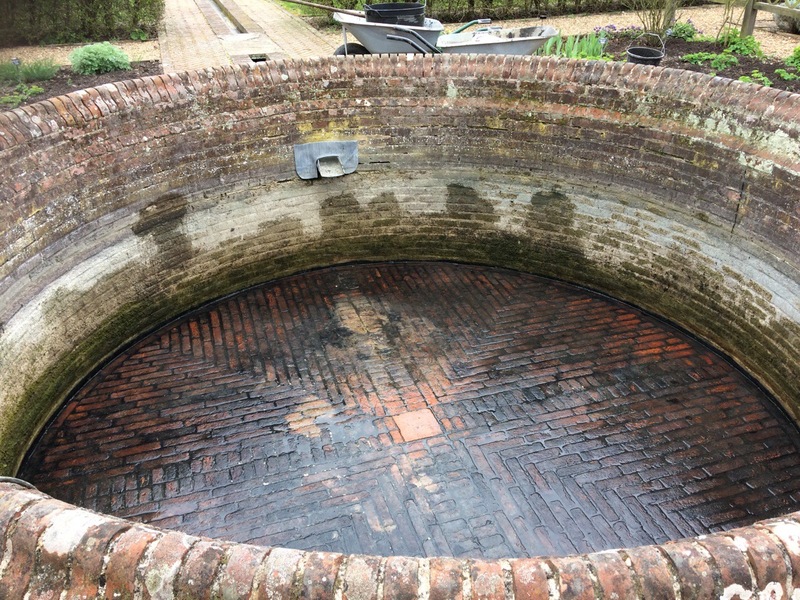 …..and it was a joy to see the fantastic brickwork base for the first time in years. So much for dealing with the murk, now to deal with the leak. 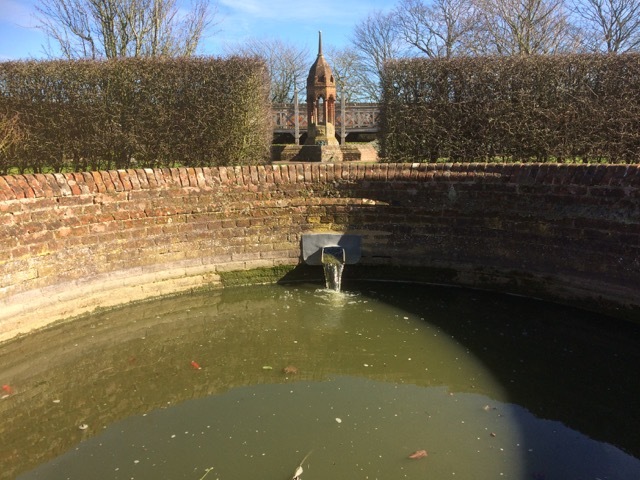 Once again we have Pete to thank for spotting the corrosion on the fountain which had been allowing water to seep through to the centre of the brickwork column and out to the surrounding ground. The solution, we hope, is to line the corroded dish with fibre glass which will be completely hidden once the water is flowing. 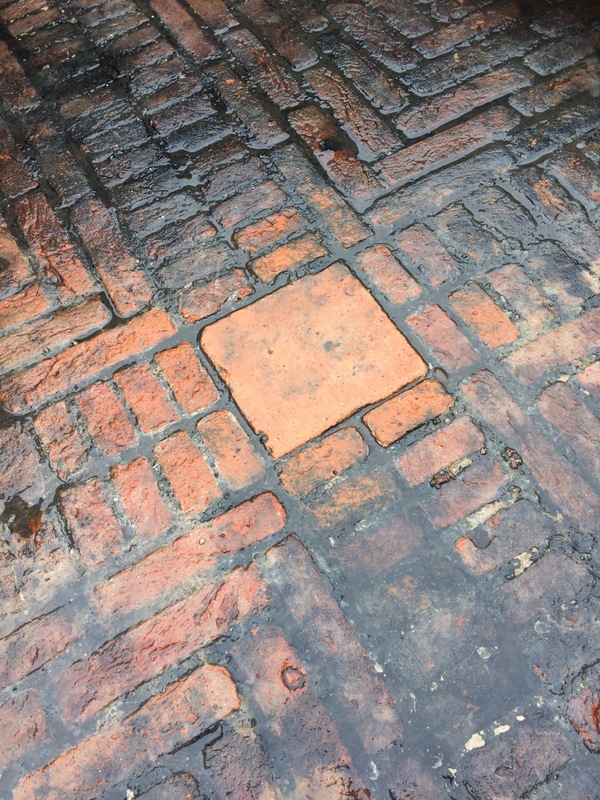 Not an authentically Tudor solution, but fingers crossed this will work and issue that has had us scratching our heads for years will be solved. I will let you know. The final step will be to re-introduce the water lilies and fish (maybe three or four – all males!). Anyone wanting to see the water sparklingly clear and the pattern on the brick flooring had better visit soon before a more natural balance is restored and the lilies do their excellent job of covering the surface. Phew, what an episode that has been! After all the muck and grime of pond cleaning it has been rather nice to have contrasting moments to admire the stunning display of spring bulbs. Always such an uplift at this time of year. The gentle, subtle charm of our native bulbs, the Lent lily (Narcissus pseudonarcissus), the snake’s head fritillary (Fritillaria meleagris), the cowslip (Primula veris) and our native tulip (Tulipa sylvestris) are hard to beat. But I must say a splash of the more exotic has been very welcome lately too. We went for a combination of bright and cheerful tulips and the intoxicating perfume of Delft Blue Hyacinths to attract visitors to the start of our plant sale season. 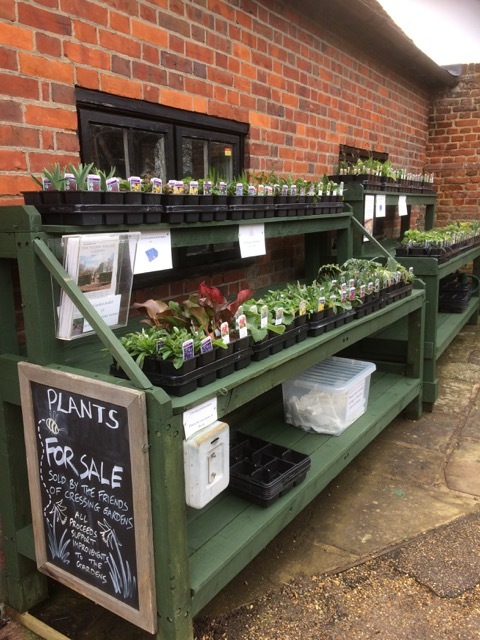 We are hoping to do better than ever with our plants this year, with our new sales area near the Visitor Centre. It has long been a frustration to us that many visitors seem to visit the tearoom for their delicious offering from Wilkins & Sons but rarely venture further to see what temptations there are on the rest of the site. Maybe we could entice them out by having things for sale visible from the tea room. We are not intending to sell Community Shedders! 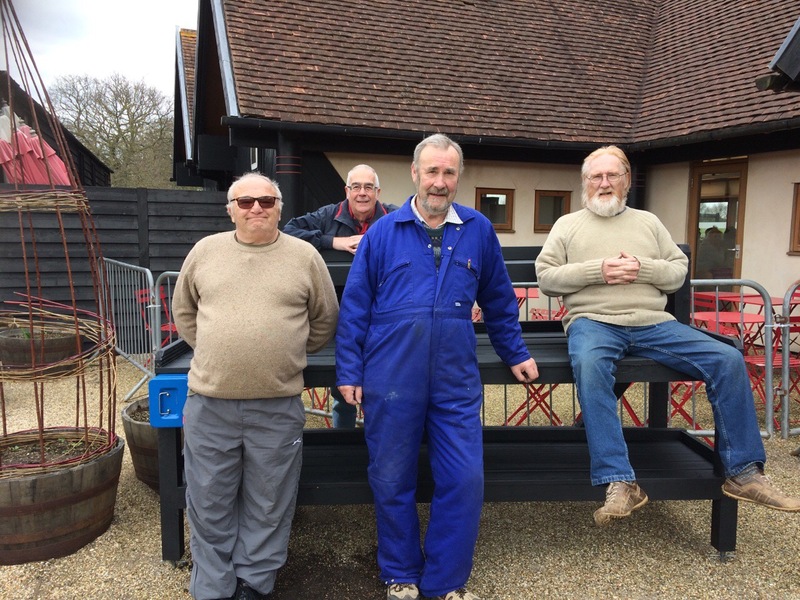 These are the kind gentlemen who constructed our new plant table and carried it to its new position. 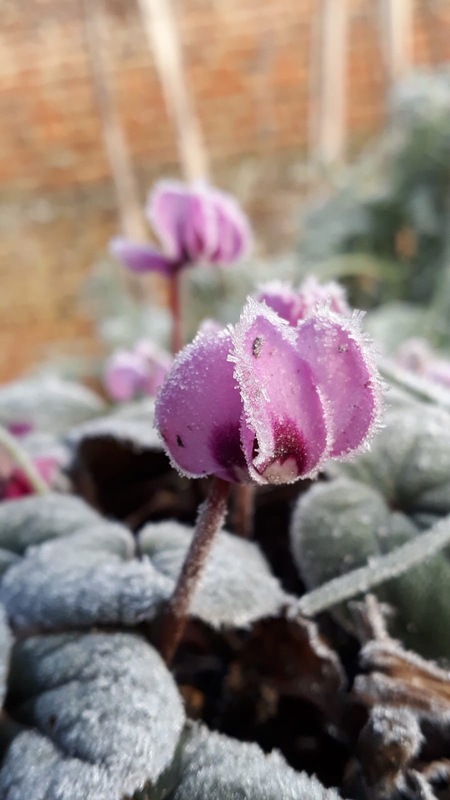 Still a bargain at £2.50 per plant, our lovely range of perennials are ready and raring to get going in your gardens, so please visit to buy a few this Easter. 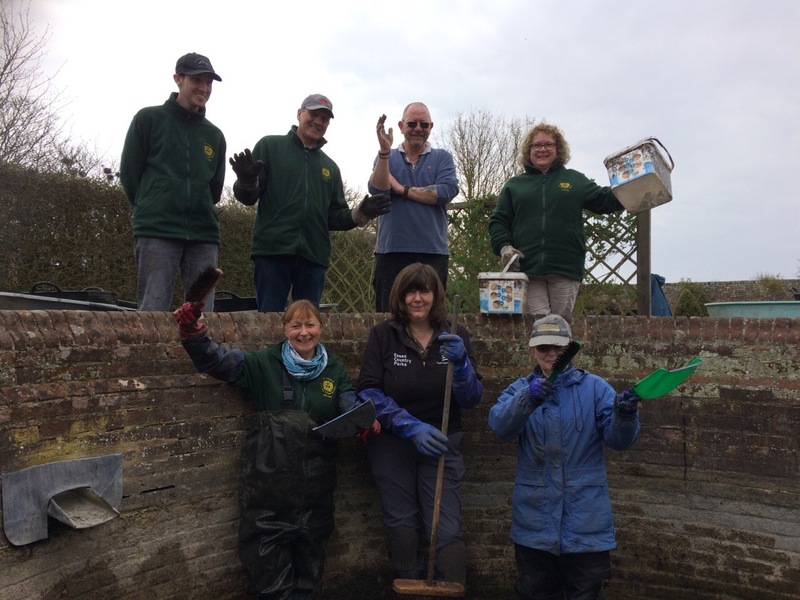 Part of the Heritage Lottery money was allocated to improving our interpretation and training our volunteers. Three talks have been planned for this year and the first one took place on a cold but dry day in early March. 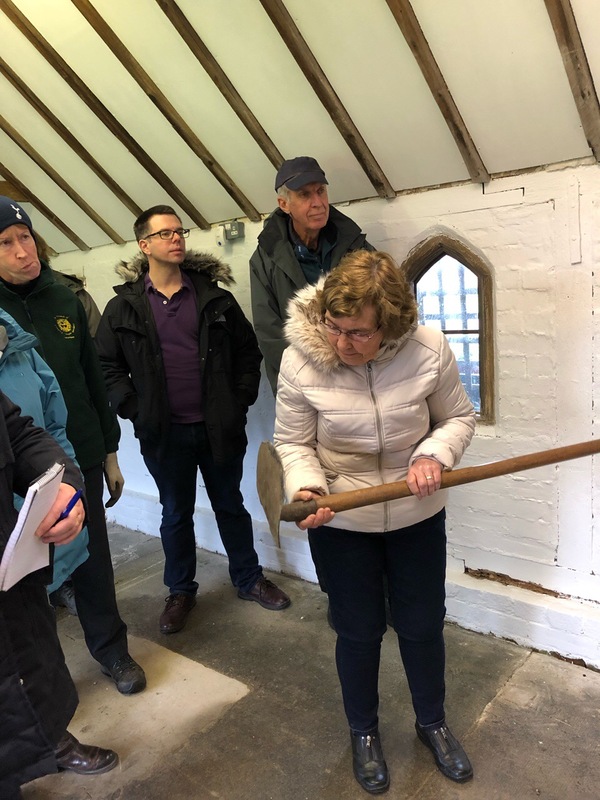 The volunteers were treated to a fascinating and very informative talk by Hilary Mynott which covered the history of the Templar barns, the Tudor walled garden and folklore surrounding the plants grown in our garden. 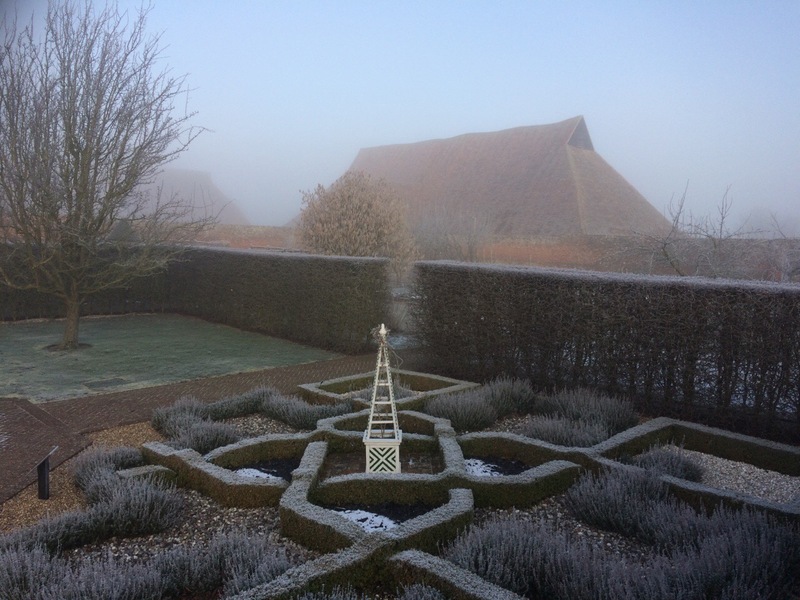 In the second talk early this month, Mike Brown, the historic gardener, treated us to a very enjoyable slideshow of Tudor gardens, describing their main features and giving some good examples of Tudor gardens to visit around the country. 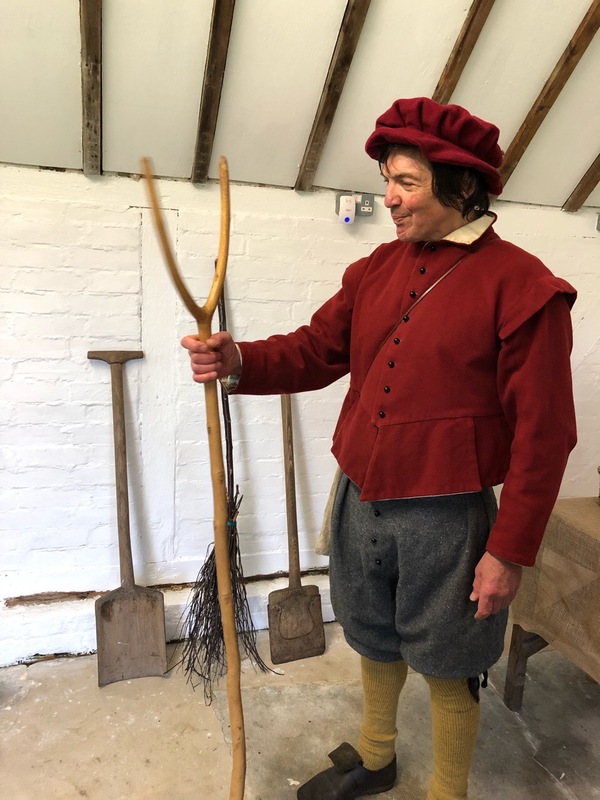 He followed this with a demonstration of his diverse collection of Tudor gardening tools, including wooden spades, bird scarers and a Tudor rat trap! Mary examining a tudor mattock, used for digging in the same way we might use a fork. Later in the year we are looking forward to the third of these talks, which will be a demonstration of distilling and the uses of herbs in Tudor times. We will all be so well educated, courtesy of the Heritage Lottery Fund! 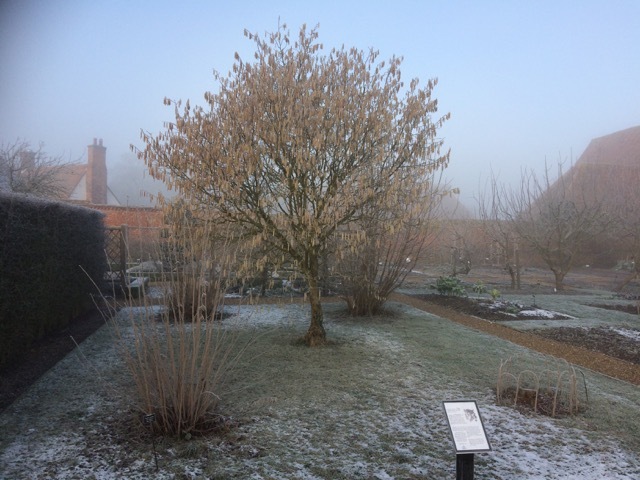 With Easter just around the corner we have been doing some research about the customs and traditions of Easter and the plants that can be seen in the walled garden this Easter time. 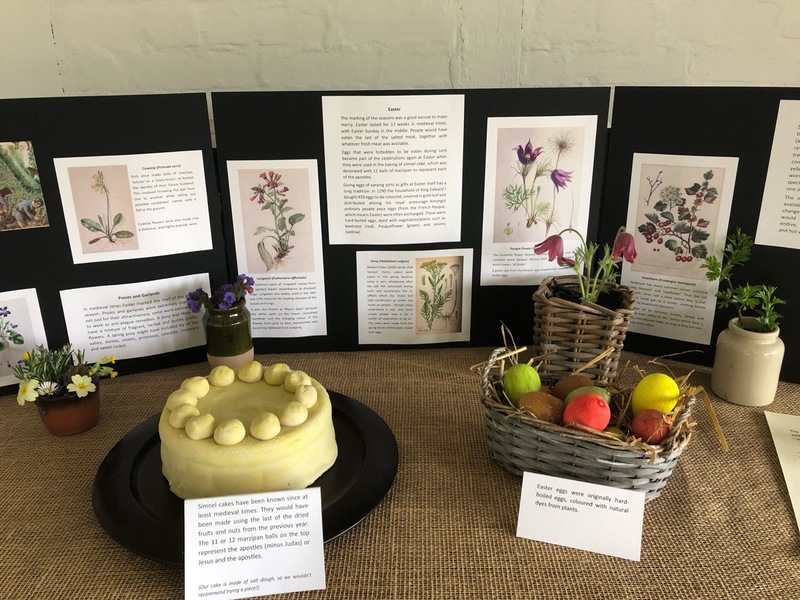 A display of what we discovered can be seen in the wellhouse and it makes very interesting reading, including the significance of simnel cakes, the ancient tradition of dyeing eggs and the making of Tansy pudding in Lent. We intend to update this table with a changing displays to give our visitors something new to experience on return visits. The next one planned will be about different textiles used in the Tudor period, followed by one on Tudor beekeeping. With the volunteers helping with the construction of these displays it promises to be an interesting and varied year. Several affectionate and very descriptive names were given to this plant including – Cull Me to You, Three Faces in a Hood, Herb Trinity, and Love in Idleness. But the one still commonly used today is heart’s ease, meaning tranquility or peace of mind. Altogether the flower is said to have sixty names in English and two hundred on the Continent. No wonder plant naming was confusing before Linnaeus gave us his straightforward binomial system! A fitting thought, as I jet off to Japan for my son’s wedding. What a difference a year makes! 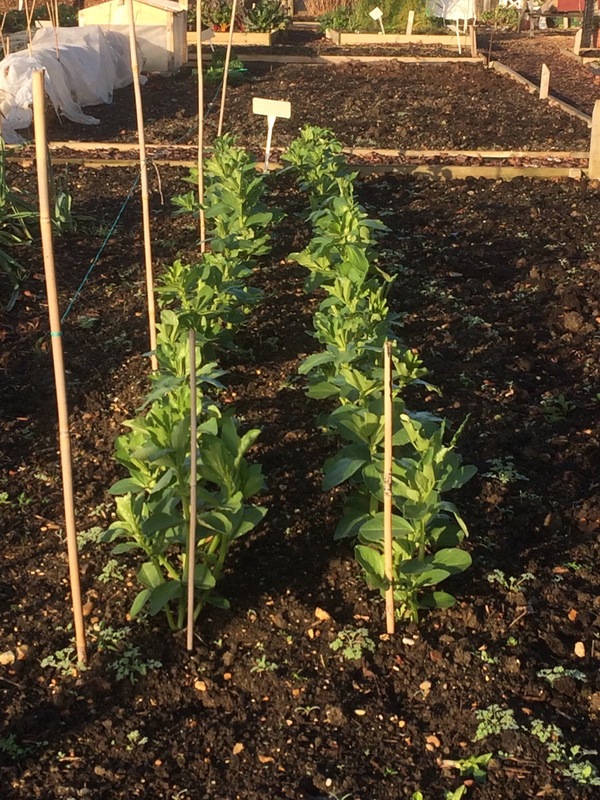 February saw nearly 3 weeks of unseasonably high temperatures and can you believe that on the 26th (a year after experiencing the Beast from the East) we had a temperature of 17 degrees and we had to water the whole plot! The temperature was so high that some seedlings in the greenhouse outstripped themselves and became too ‘leggy’ to use, but on the other hand it did bring the skylarks out singing and the first peacock butterfly was seen. Everything and everyone reacts to an increase in daylight. Its a fact that plants react to the amount of daylight by changes in a light sensitive pigment called phytochrome. During daylight hours it’s converted to an active form and put simply the more daylight, the sooner it gets to become an active form and cause changes in plant growth. So as we have seen an extra hour of daylight in the last 3 weeks so we have seen growth spurts in some, not all, of the plants. 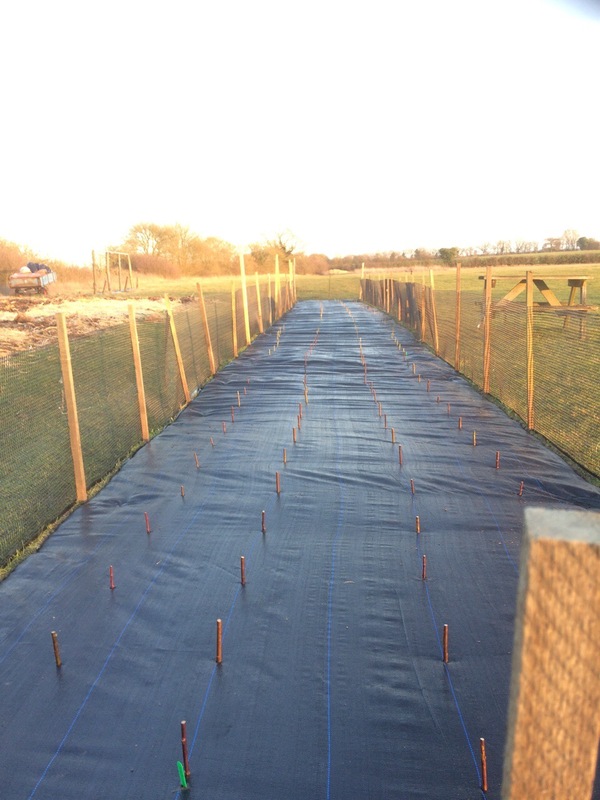 Also, by covering some of our raised beds with old pond liner and tarpaulin, the soil temperature has increased by 2-3 degrees above the surrounding soil. This will give us a head start when sowing commences outside later this month. As in any garden there are successes and failures. Last winter we were overwhelmed with sprouts but this year they have been poor. On the other hand the purple sprouting broccoli has been excellent, despite the wood pigeons best efforts to nobble it. 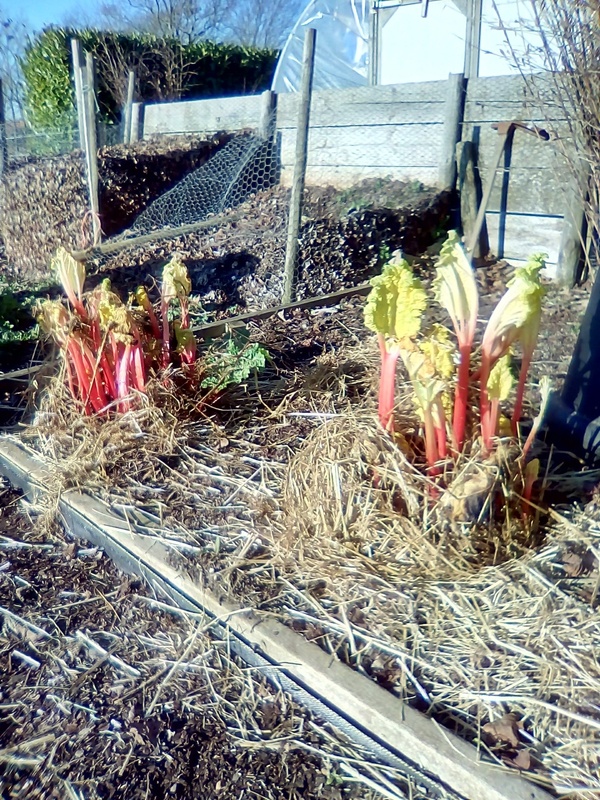 Seed potatoes are ‘chitting’ and the forced rhubarb has produced a good crop of pale juicy sticks. 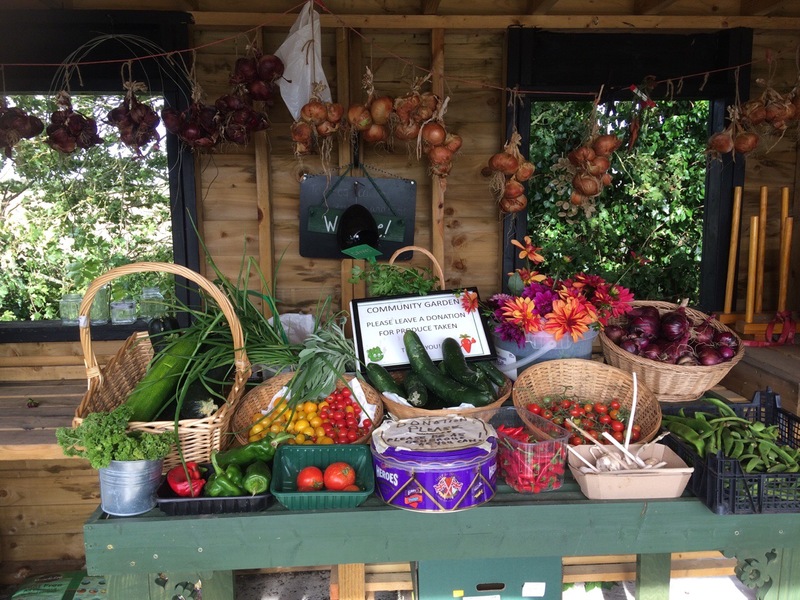 Early tomato, pepper and cucumber seeds have been sown, but only to produce plants for growing on in the polytunnel, as the temperature and soil conditions outside will not be suitable for tender plants to go out untill late May. To finish, there is an interesting article in this months Saga magazine regarding the benefits of gardening. 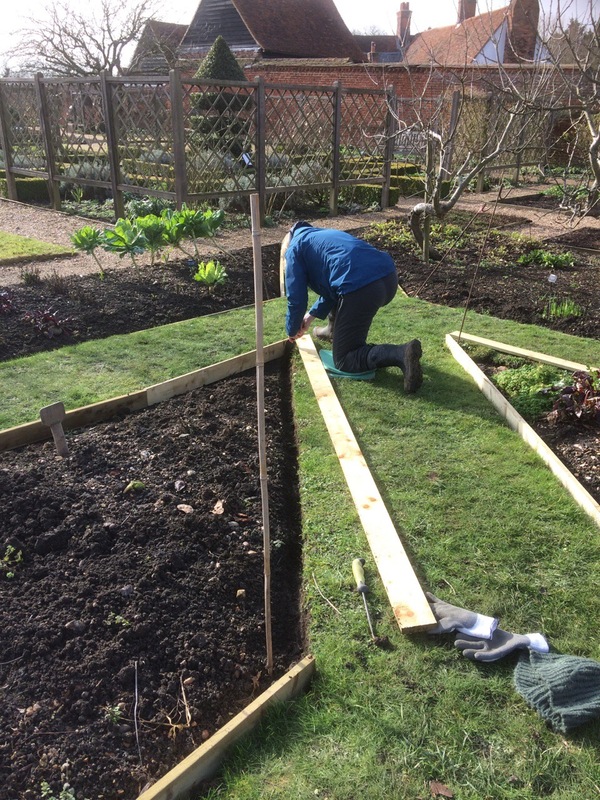 It confirms that gardening can have a deep and lasting effect on a raft of health problems, from aiding recovery from illness and loss of a close friend or relative, improving your physical health through digging, raking etc. and giving you a sense of achievement. It can also help with managing symptoms of age decline, unlocking memories, socialising, even just standing and looking, touching and smelling. The start of March already and the recent spell of unseasonal weather has made it feel more like May. I am jolted into the realisation that spring is upon us and there are still several winter jobs to get done. My optimism at the start of autumn, with that long list of things we could achieve over the winter months with less watering and weeding to do, has changed to a modest acceptance that some things will just have to wait! Having said that, with a glass half full mentality, quite a lot has happened this winter. 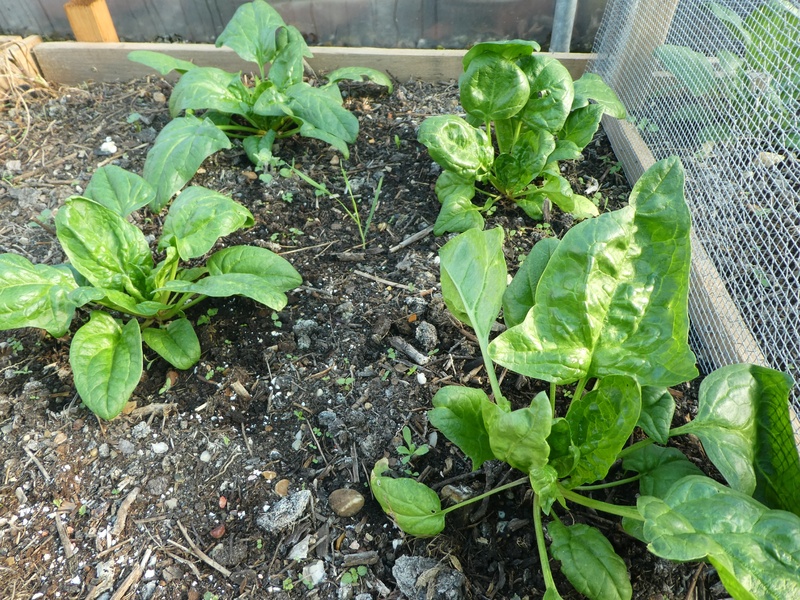 For several years I have wanted to replace the wooden bed edges in the potager, which had rotted away long ago. What was meant to be a very geometric and symmetrical part of the garden had, with the vagaries of my grass edging, become something you might think had been cut by somebody under the influence! From above you can see the intended design nicely. From the ground it was a different story. But now the straight lines and even shapes have been restored and it looks pretty impressive, not to mention making it much easier to maintain with our shears. Thanks to Pete and the volunteers who helped with this rather back breaking task. 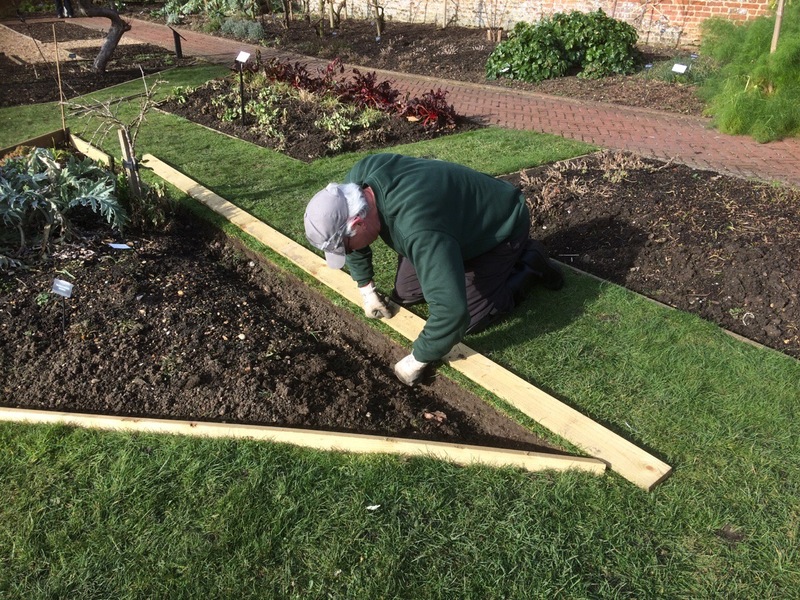 Feeling rather smug at this straight line business, we have also tackled the planting of a new willow bed. 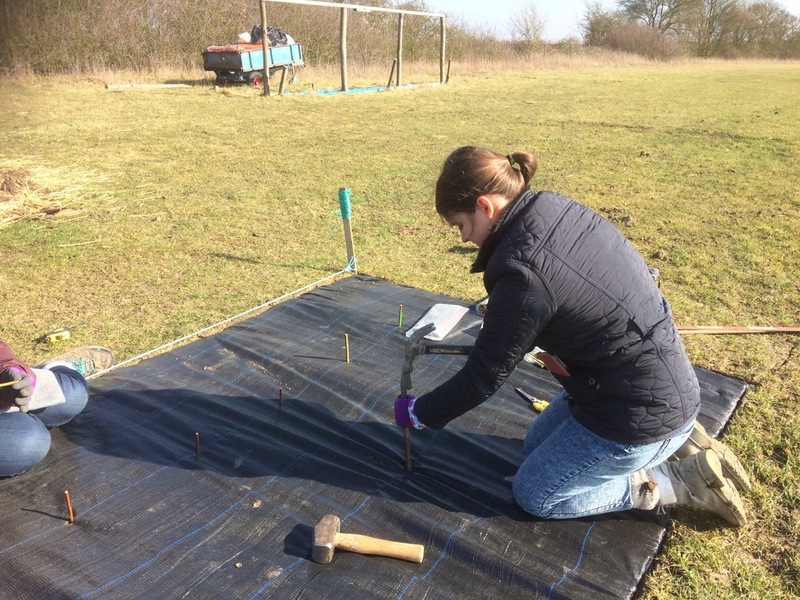 The idea is to provide a windbreak for our no-dig area of the community garden whilst also giving us a supply of coppiced willow to use around the garden and for willow weaving projects. Admittedly they don’t look very promising yet. It looks like some sort of landing strip or a hurdle race for snakes, but you just wait….these are willows remember and we are expecting them to grow….pretty fast. The weed membrane is to suppress weed and grass competition, which would be the biggest threat to these plants’ survival in the first few years. We pierced holes through the fabric and planted the willow cuttings two thirds of their length (30cm) so that they don’t dry out while developing roots. The other big threat in the early years is rabbit and deer damage, which is why we have surrounded the whole bed with some netting. By next winter they should be ready for their first light coppice, although it will be two or three years before they are producing the strong annual growth we are hoping for. 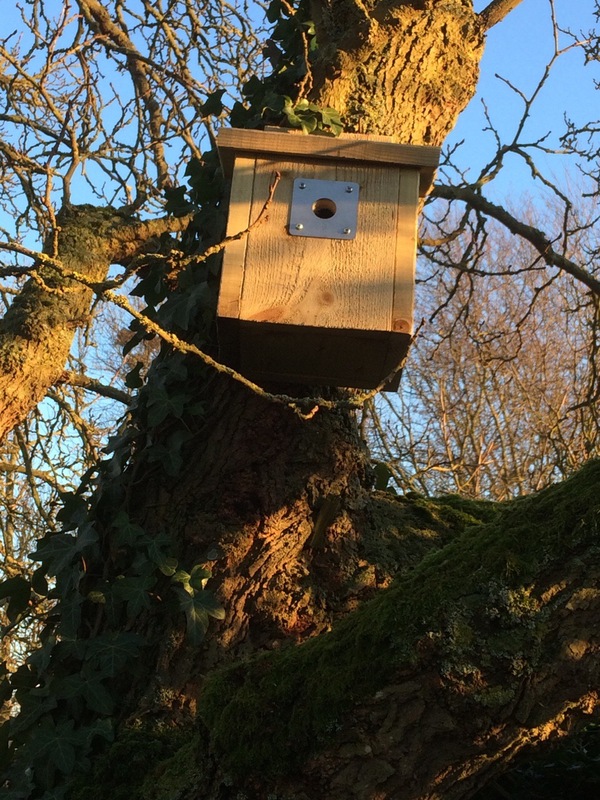 From then on we must coppice them each winter (or we will have trees – yikes!) using the wood for willow projects and plant supports and offering it to local weavers who would like some interesting colours to work with. As an extra benefit, willow is good for wildlife, producing some wonderful catkins and the colours of the winter stems should look stunning. As for varieties, we have chosen types that are suited to our growing conditions, a range of colours, vigour and applications. This was quite a task in itself, with over 300 varieties of species and hybrid willows in the National Willows Collection at Rothamsted. Our chosen types include ‘Dicky Meadows’, ‘Dark Dicks’, ‘Jagiellonka’, ‘Bori Pescara’ and ‘Netta Stratham’, to name but a few. It is also feels rather good to be doing something to preserve the ancient craft of basket making. The earliest record in this country is of a basket maker who was subject to the Suffolk Poll Tax in 1381. The guild of basket makers was formed in 1570. Today, the majority of commercial willow growing occurs in the mid- Somerset ‘Levels’, the most important species for basketry being Salix triandra, Salix viminalis and Salix purpurea. 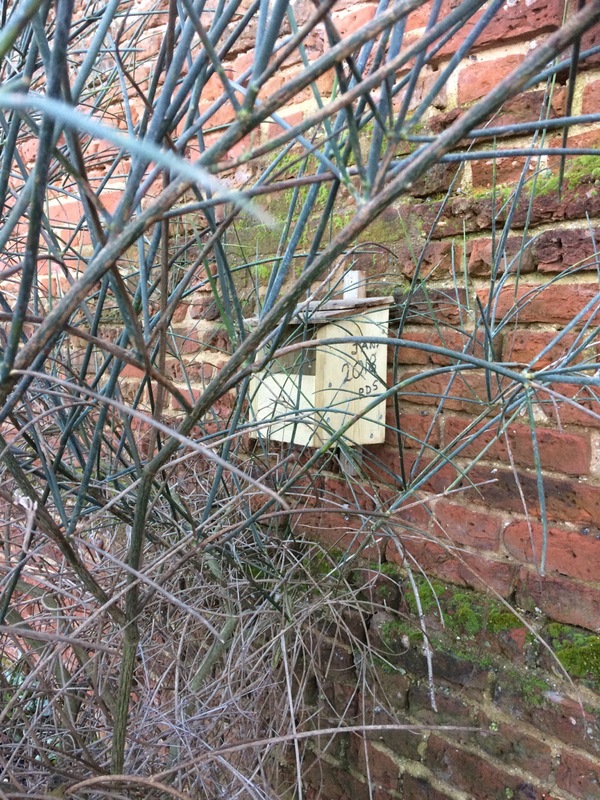 The south-eastern counties have been better known for the growing of cricket bat willow, where they are planted at wider spacings on distinct mini pollard systems of about 1m height. Mini pollards make harvesting and weed control easier and rabbit damage less of a problem but they produce a higher proportion of curved rods, whereas a plantation close planted and coppiced to ground level provides straighter, more slender and uniform stems, suitable for basketry. Fingers crossed it all works out this way. 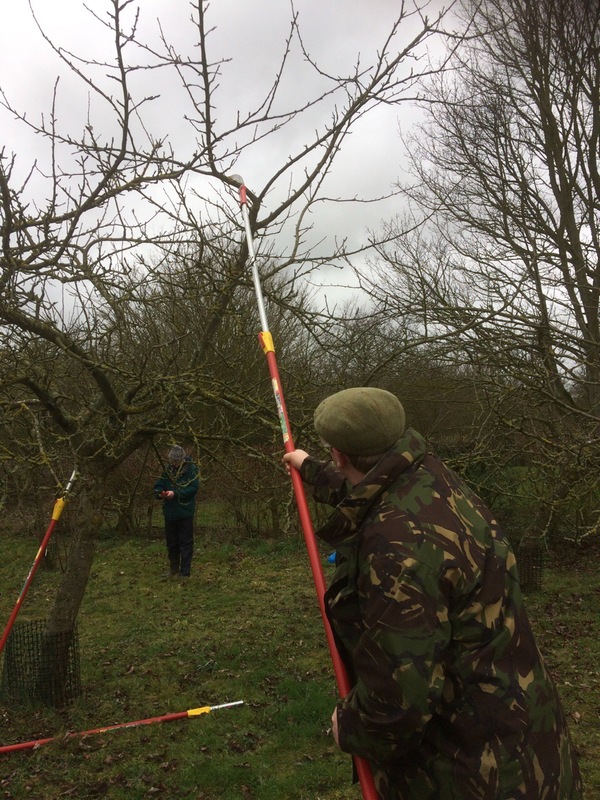 The last of the apple pruning must be completed this month before the trees come into leaf. 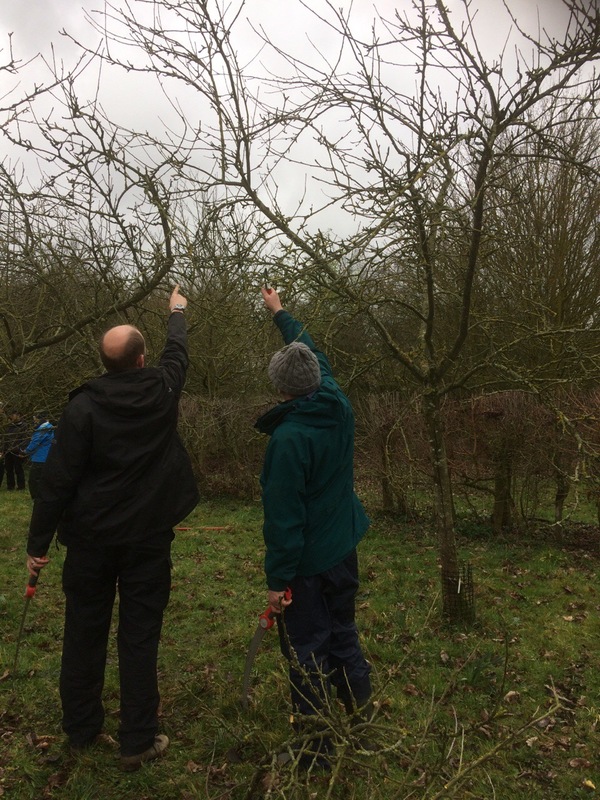 To help us achieve this we hosted another apple pruning workshop, organised by Orchards East. It was a rather dreary, windy day, but everyone got stuck in enthusiastically, with much discussion about what to chop off, what to keep, what to leave for another year and what probably shouldn’t have been done the last time! Some brave decisions were made…. 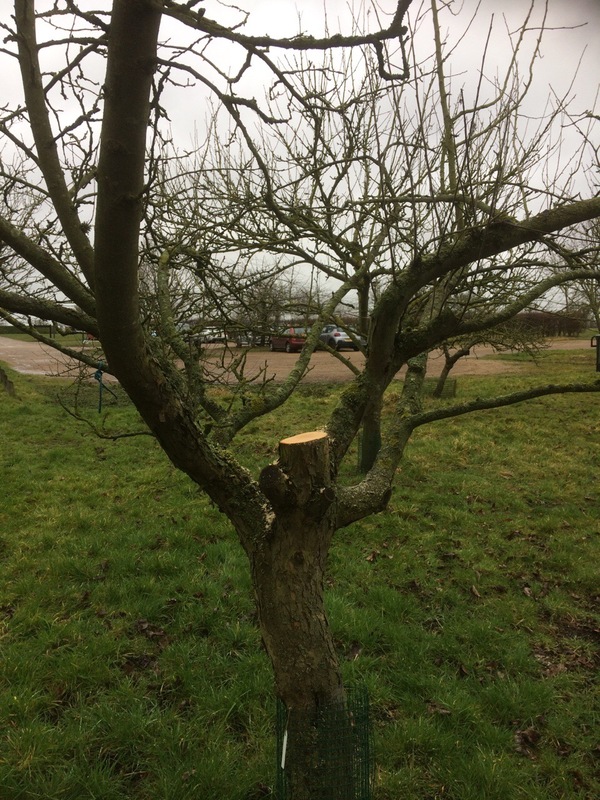 Only 20% of a tree should be pruned out each year, so this large cut was the only action taken on this tree. Renovation is best undertaken in stages over several years and one of the hardest things to do is knowing when to stop! As with all our trees, the aim is for an open centred canopy to allow as much light and air into the centre of the tree. 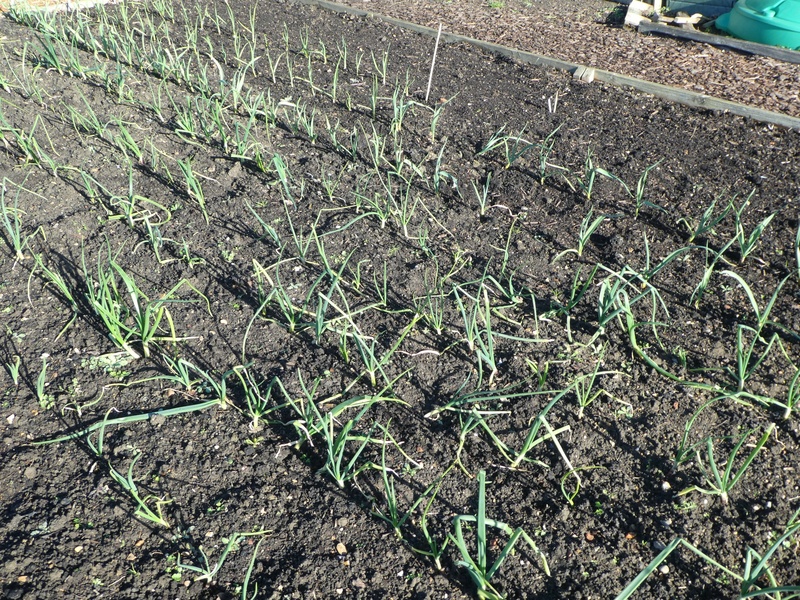 This large cut will most likely result in a flush of vigorous watershoots, to be dealt with next winter, but it has produced a more balanced, spreading shape overall. 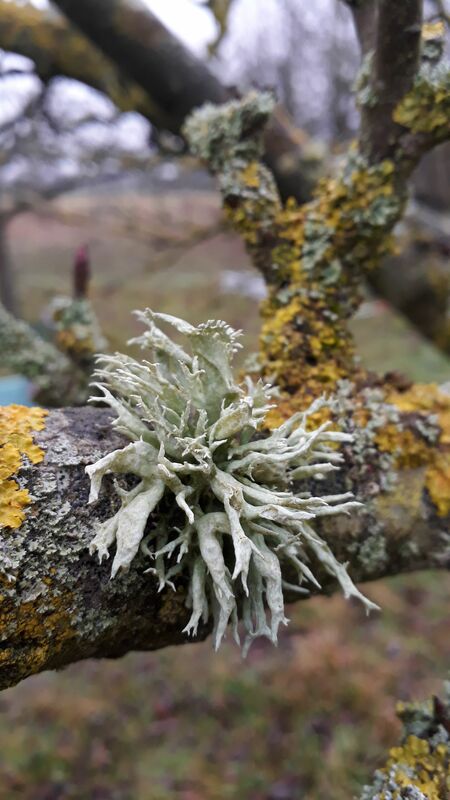 We are often asked about the wonderful lichens growing on the trees in our orchard. What are they and are they harmful to the tree? A lichen is not a single organism; it is an association between a fungus, an algae and/or cyanobacteria (bacteria capable of photosynthesis) . Like all symbiotic relationships it is one which benefits both parties. The fungi requires sugar as a food source, provided by the algae via photosynthesis. Meanwhile, the algae receive protection and are provided with optimal living conditions by the fungus. They probably also benefit from mineral nutrients provided by the fungi. 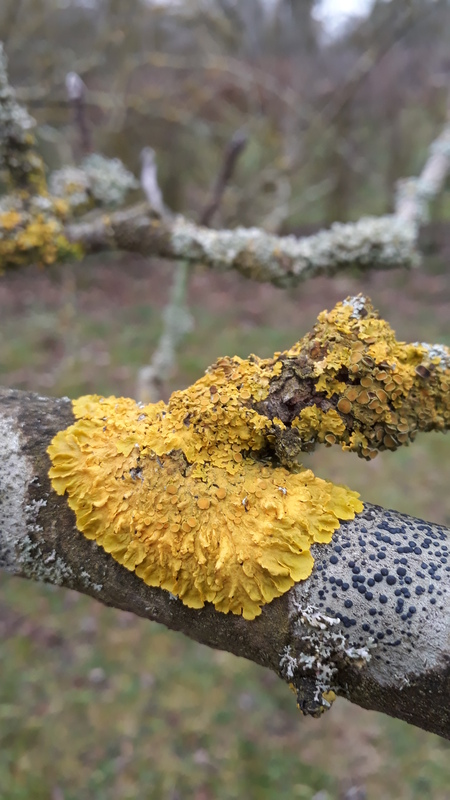 Many different fungi will form lichens and there are over 100 types of algae and cyanobacteria that grow within lichen fungi. When the algae photosynthesise, up to half the carbon they make is immediately converted to fungal sugars that the algae themselves cannot access – how generous is that! Lichens are useful indicators of good air quality and they are certainly not a sign of a diseased tree. The pH or acidity of tree bark differs between species and will dictate what lichens colonise it. 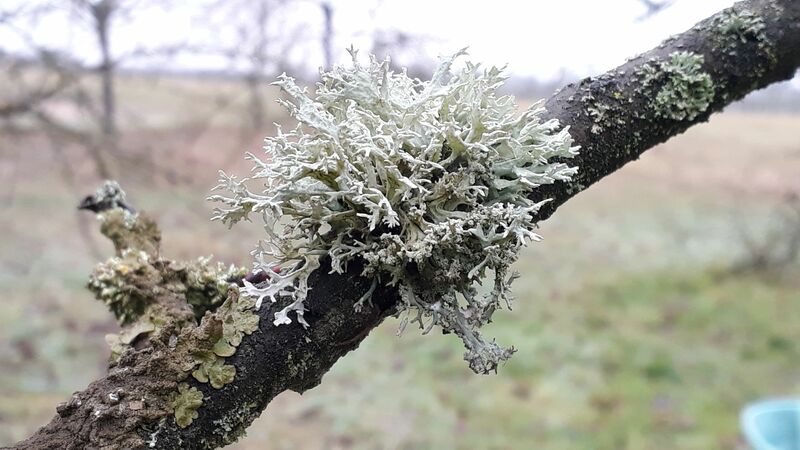 Lichens grow extremely slowly, and ancient trees and woods offer an excellent enduring habitat for them, which is one reason to protect and preserve ancient apple orchards. This amazing lichen, Evernia prunastri, is very common. It is one of the foliose type (having features resembling foliage). 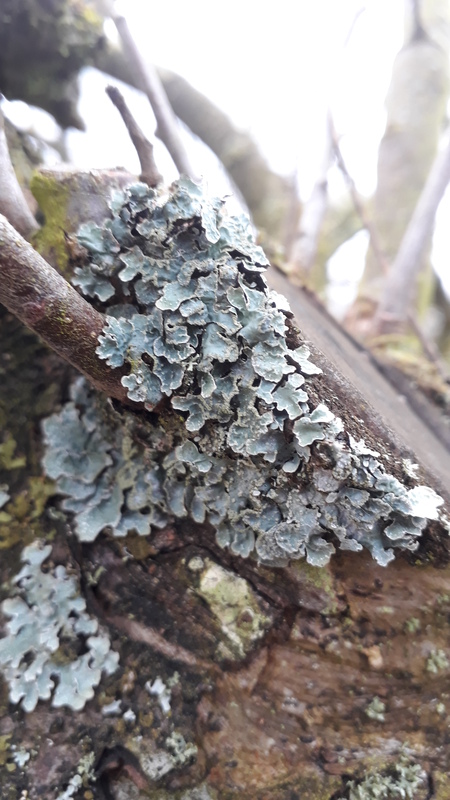 This is a fairly pollution tolerant lichen, it is widespread and can be found on deciduous trees across the country. 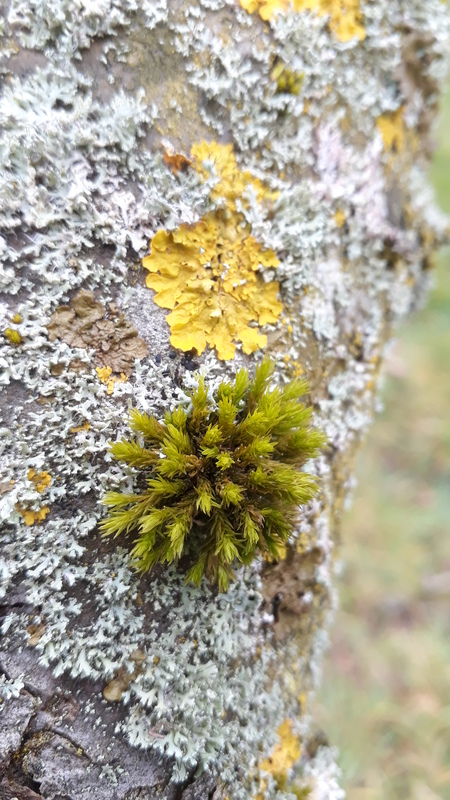 It is very often found on oak trees, hence being known as oak moss lichen. Parmotrema perlatum, another foliose type. Xanthoria parietina, a pollution tolerant leafy type. 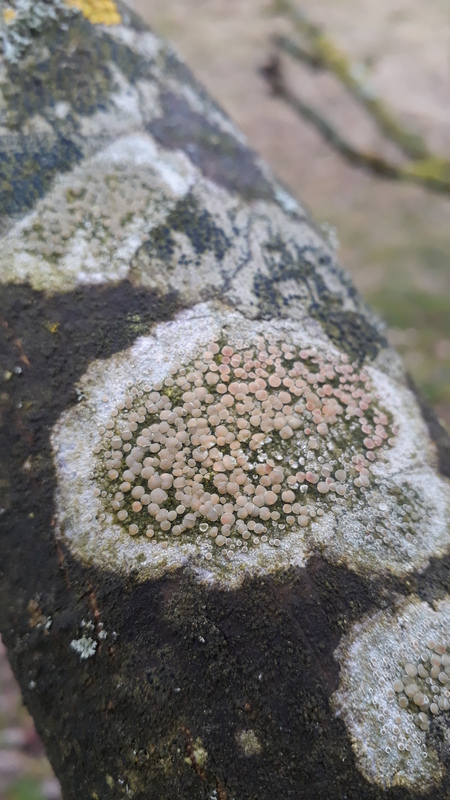 Maybe a Caloplaca lichen? Help….. this is getting difficult. My lichen identification skills are sorely stretched! There are so many types. They are quite beautiful and remarkable. If anyone wants to do some more research and let me know what they discover…..I would be interested to know. We will never run out of things to learn about in the natural world. 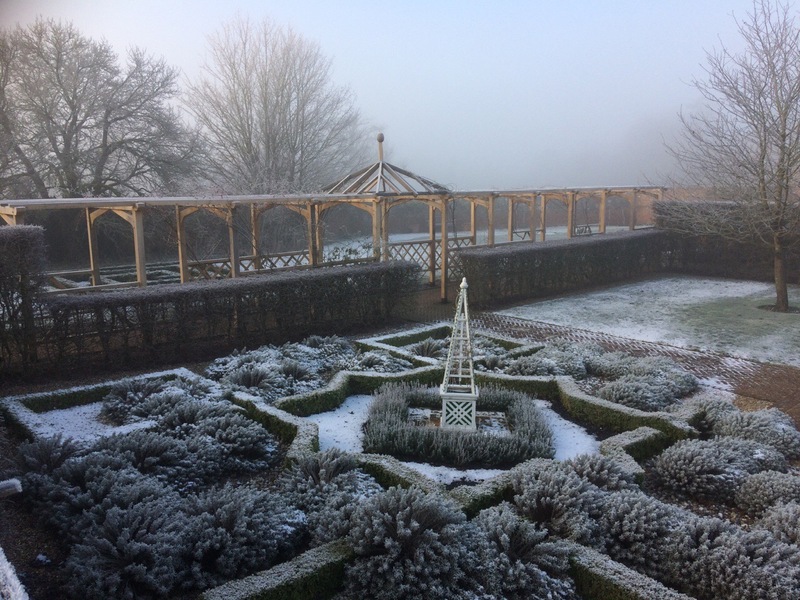 We are trying to encourage our visitors to venture further than the tearoom and come over to see what is going on in the gardens. 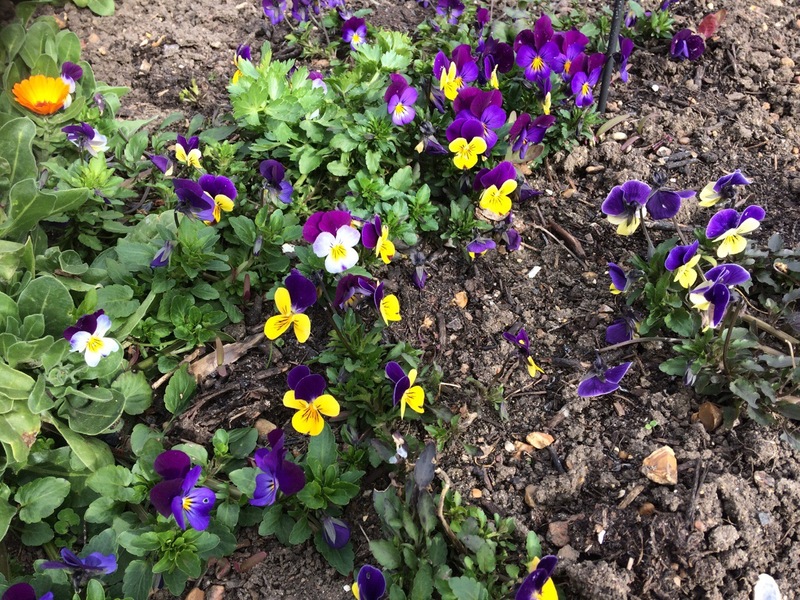 Our ‘Looking good in the garden’ board will be updated regularly as things change – complete with sample sprigs for anything particularly pretty or with a nice smell. 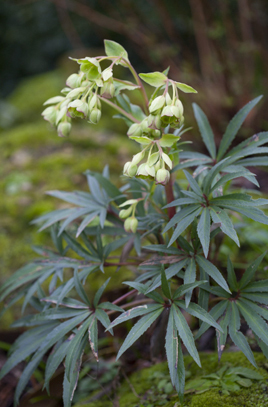 Helleborus foetidus, the stinking hellebore, gets a mention this week. It gets its name from the pungency of the foliage when crushed, but is actually a rather attractive plant and the bees never seem put off by the smell. In times gone by, the root was used to cure cattle of illness. They would bore a hole through the animal’s ear, insert a piece of hellebore root and hey presto, twenty four hours later the trouble was cured. 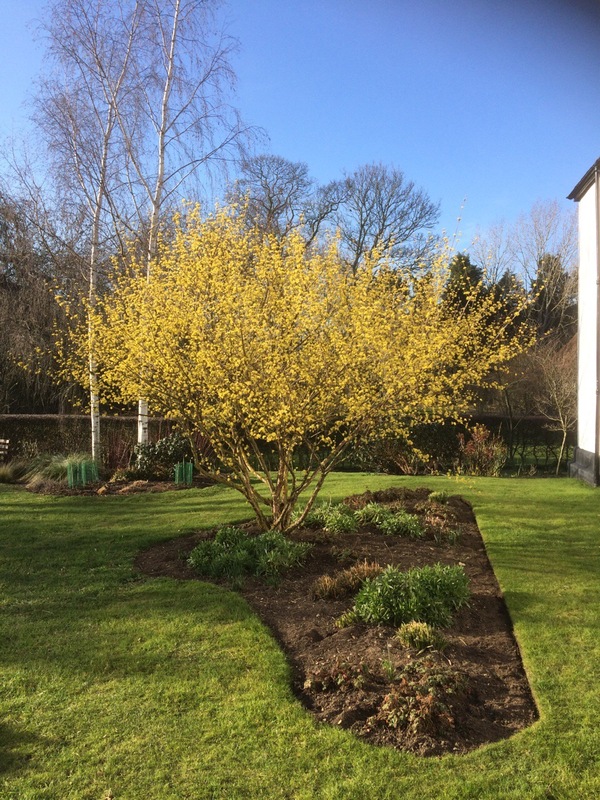 The glorious flowering display of the Cornelian cherry (Cornus mas) is another feast for the eye at this time of year and a feast for the early pollinators too. 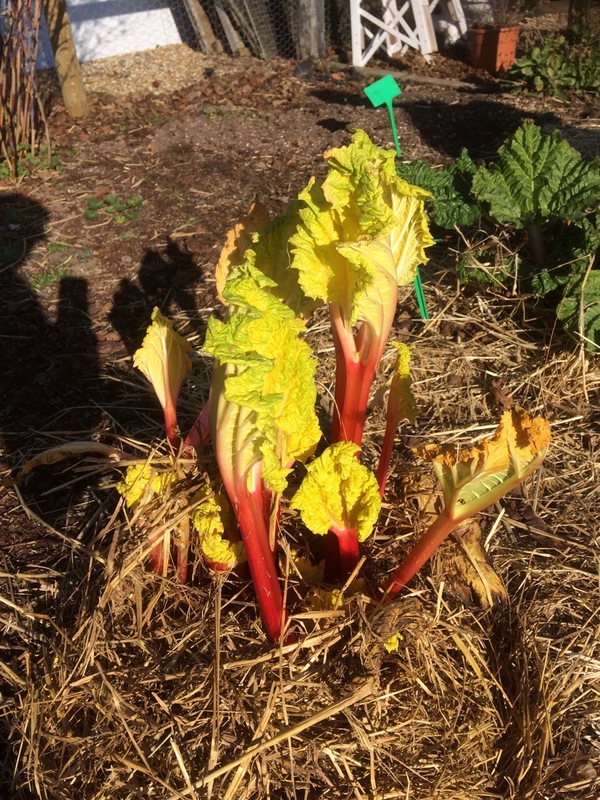 There are feasts for the taste buds coming along in the community garden, with the first succulent stems of our forced rhubarb. The crown of this plant has been covered to prevent light reaching the stems. This encourages them p to make early growth and the pale, forced stalks can be harvested for use in cooking when they are 20cm – 30cm long. This should only be done on established rhubarb plants. Young plants may not have sufficient energy reserves to produce the early stems, and subsequent growth may be affected. Time for a crumble! And with that tasty thought I urge you all out into your gardens to get growing for another year. Our new arbour is now finished! 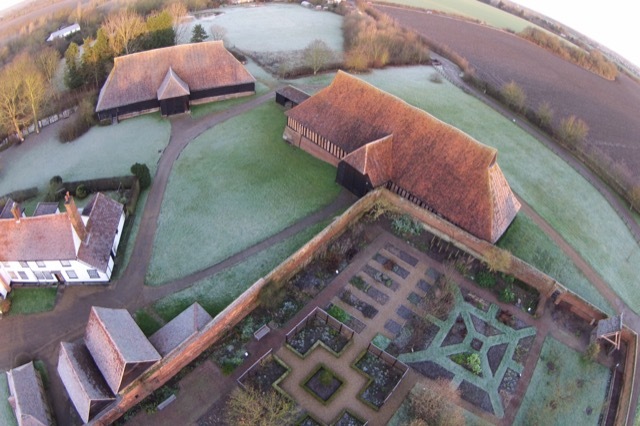 This is an important milestone in our @heritagelotteryfund project ‘Celebrating the History of Cressing Temple Garden’. Come along to this free talk given by Joe Bispham, the historic joinery expert responsible for building the new arbour. Joe will talk about was involved, the techniques and materials used and the challenges faced along the way. Weather permitting there will also be a chance to look at the arbour itself. The lecture is free, but please contact megan.lloyd-regan@essex.gov.uk to register your interest so that she knows how many people to expect.